Record Mirror was a British weekly music newspaper, published between 1954 and 1991. It became popular in the 1960s, featuring colour pictures and full UK and US singles chart listings, and was one of the four leading music weeklies of the '60s, alongside New Musical Express, Melody Maker and Disc & Music Echo. Later Record Mirror went through a number of relaunches and changes of ownership before closing in 1991. Writers with Peel connections who worked for the paper included Tony Hall and Charlie Gillett. Peel himself never wrote for the paper, but was interviewed for it in 1974 and in 1986 (see link below). He was mentioned fairly regularly in Record Mirror's pages, but the paper catered for a variety of audiences, not just those whose tastes were formed by listening to Peel's shows. Because of this, he usually featured in its best DJ poll listings but was rarely the winner, and, as can be seen below, some of the articles, artist interviews and listeners' letters which referred to Peel were critical of him. August 10, 1968; "From The Underworld - Underground Groups by Derek Boltwood", mentions many of the groups who were part of Peel's Top Gear playlists but often gained greater recognition in the US and Europe than at home. The writer blames lack of exposure on the BBC for this situation: "John Peel does give valuable airspace to so-called uncommercial sounds - and strangely enough his programme is one of the most commercial on the radio...". Marc Bolan of Tyrannosaurus Rex remarks that airplay on Peel's show aided the chart success of their single "Deborah". December 7, 1968; David Griffiths' review of Cream's farewell concert at the Royal Albert Hall includes a mention of "pleasant compering by John Peel", who was "quite comical", expressing his own ideas on who should appear at the Royal Variety Performance. 13 September 1969; Front page article announcing programming changes at Radio 1 in the coming autumn. Peel's Top Gear was to move to Saturday afternoons for a 3-5 pm slot, with Johnnie Walker's show being brought forward from 1-2.55 pm. It was also noted that Peel would lose his Wednesday evening show. 10 January 1970, "A lot of people must hate me". Interview with Jethro Tull's Ian Anderson: "In that respect one play on the Jimmy Young radio programme is worth ten of John Peel's - that is not meant to sound derogatory to John Peel but by a play on Jimmy Young's programme we would probably be reaching millions of people who would never have thought of listening to us and maybe a few would like it...."
21 March 1970: Interview with the Move. Roy Wood: "We would very much like to do a John Peel Show, but we weren't quite his cup of tea before. I think we would be now, but of course we have to prove it. And you can't really appear on theother people's shows, like we might have in the past, because then John Peel wouldn't want to know." 16 May 1970: Interview with Noel Edmonds; "Now at the age of 21, he has just joined the BBC as their youngest DJ...."Blackburn is predictable and so are most of the deejays, with the possible exception of Everett and Peel.....I hate the music that he features, but I admire John Peel," he said with honesty." 25 July 1970: Letter from Coventry DJ Craig Crunchbukkit: - "I prefer the 'heavier' stuff and loathe most soul. John Peel also comes in for a lot of 'stick' because of his lifeless attitude, Yes, he is lifeless, he does mumble, but he knows his stuff and presents perfectly listenable shows for this type of music". 22 August 1970: Letters page, with pictutre of Peel - a reader writes in praise of Johnny Moran's "First Gear" show, broadcast in the Top Gear slot while JP was on holiday and with a rock'n'roll playlist; "And as far as I'm concerned, John Peel can stay on holiday permanently." 29 August 1970: Interview with Stewart "Wooley" Wolstenholme of Barclay James Harvest: "John Peel heard our record "Early Morning" and liked it, so he played it. However, he heard our LP and wasn't bothered with it, although the reviews were good..."
8 January 1971: "Old Lon's Almanac - an improbable look at the year ahead"; "March: Eurovision winner John Lennon replies to chat show celebrity John Peel's accusation that his peace antics are insincere; "peace peace peace peace peace and more peace, you big twit!"" 20 February 1971: "Mirrorpick/LPs" - reviews (p.19): SIREN "Strange Locomotion" (Dandelion DAN 8001); PRINCIPAL EDWARDS MAGIC THEATRE - "The Asmoto Running Band" (Dandelion DAN 8002); STACKWADDY - "StackWaddy" (Dandelion DAN 8003); THE WAY WE LIVE - "The Way We Live" (Dandelion DAN 8004). "John Peel's relaunched Dandelion label will, hopefully, receive more attention than of late. The initial release batch of four are of a higher standard than previous Dandelion product with The Way We Live being the outstanding offering...."
17 April 1971: Marc Bolan interviewed by Keith Altham (p.7): "...John Peel rang up to say he was 'beginning to feel like a groupie' and publicist B. P. Fallon said `GodBless' as is his wont and I got a cab in Little Venice and went home." 29 May 1971: Peel placed fourth in paper's "Top Jock Survey" (p.15), benind winner Jimmy Savile, Tony Blackburn and Dave Lee Travis. 5 June 1971: Interview with Colin Earl of Mungo Jerry: "Just at the moment we would be happier if Peel gave us a play because he seems to have ignored us since 'In The Summertime' - we get the impression he doesn't like us anymore..."
24 July 1971 (p.11): Interview with Harry Simmonds, manager of Savoy Brown and Chicken Shack, who complains about the club scene and lack of radio exposure: "What we need is 10 John Peel's, 10 Mike Raven's, 10 Rosko's and the hierarchy of the BBC to open their eyes every now and then..."
7 August 1971 (p.3); "Inside Straight" - column for soul record collectors, by Tony Cummings: "Someone should mention to John Peel ('the most informed record reviewer' - 'Scene And Heard') that it was the Velvelettes who cut 'Needle In A Haystack'. The Velvelettes were the black girl group used for a time by the late Cyril Davies." 25 September 1971 (pp.8-9): "The world of Radio - Number two in a series by Rodney Collins". Long piece on new developments at Radio 1 - interviews with "new" DJs Dave Lee Travis, Dave Eager, Alan Black and Bob Harris ("Bob lists John Peel, Johnnie Walker and Terry Wogan among the bradcasters he most admires") as well as with Douglas Muggeridge and Teddy Warrick. 9 October 1971 (p.2): Mirrormail - readers' letters page, headlined "We don't all like John Peel". A teenage reader criticises Radio 1's programming: "...And when we turn on the radio at three o'clock on Saturdays - the peak listening hours - it's that horrible, rubbishy, noisy programme, introduced by that weird DJ, John Peel. In fact no one I've asked likes the programme...We don't all like John Peel music"
30 August 1975: the "Who, When and Where" section (p.20) carried the news that late night rock was returning to Radio 1 at the end of September - in stereo - and that Peel would be presenting an hour-long rock show from 11 pm until midnight Monday through Friday. The show was to begin on Monday 29 September together with other Radio 1 schedule changes. 1977 Readers' Poll, published in isue dated 12 February 1977 (centrespread): John Peel no.2 in DJ category (after Noel Edmonds), no.3 in Radio Show category (after Noel Edmonds' Breakfast Show and Tom Browne Top 20). 30 September 1978: the News section (p.4) carries further news of Radio 1 schedule changes as from 11 September, including John Peel's show now running from Monday to Thursday only "with a new show between 10 and midnight on Friday featuring live rock and records". In the 1979 Readers' Poll, published in issue dated 12 January 1980, Peel won both the Best DJ and Best Radio Show categories. The same issue featured an interview with producer John Walters talking about Peel. It's not clear whether Peel himself was unavailable for the interview or whether he had refused to do it. 1980 Readers' Poll: no.1 DJ of the Year category (no.2 Vance, no.3 Read). On page 2 of the issue dated 3 January 1981, Record Mirror ran a news item about Peel leaving Radio One to join Capital Radio. In a "lucrative" deal Peel would be given the station's breakfast show slot with four hours of programmes seven days a week. Peel is reported to have said that he new job would give him "security for my wife and family, something I would never have got with Radio 1". Radio 1 Controller Derek Chinnery described the move as "night time robbery". The same page also ran news stories about David Bowie buying his own theatre and a new supergroup involving Dave Edmunds, Nick Lowe and members of The Police. Although a casual reader would find them competently written, all three "news" items can be considered as fake. The article may well have been intended as parody or satire; it seems improbable that Derek Chinnery, who according to Peel "disliked me intensely, and took every opportunity to let me know that this was the case",would have been upset at the DJ's departure . Peel's presentation style and playlists had little in common with the pop radio breakfast shows of that time, and he certainly wasn't "an influential voice among... the housewife audience", as the article claims. What's more, the notion that Peel's deal with Capital would involve a tie-up with a clothes manufacturer seems particularly bizarre, given his lifelong indifference to fashion. John Walters firmly denied the Peel to quit Radio 1 story in a brief article in NME dtd. 31-1-1981 (which also previewed the BBC2 Arena documentary "Today Carshalton Beeches....Tomorrow Croydon"). 1981 Readers' Poll: no.3 in 'Top DJ' category (after Read & Travis). 1982 Readers' Poll: no.5 in 'Best DJ' category (after Wright, Read, Jensen & Powell). 1984 Readers' Poll: no.4 in Best DJ category (after Wright, Read & Davis although ahead of Powell, Long & Jensen). 1985 Readers' Poll: no.2 in 'Least Offensive DJ' category (after Wright and one place ahead of Long). 1986 Readers' Poll: no.2 in 'Least Worst DJ' category (Long at no.1). 1987 Readers' Poll: no.2 in 'DJ' category (Long still at no.1; all top 4 as previous year). 1988 Readers' Poll: no.4 in 'Best DJ' category (after Mayo, Brooks & Wright). Did not figure in 'Worst DJ' category. Radio 1 top in Best Radio Station category. 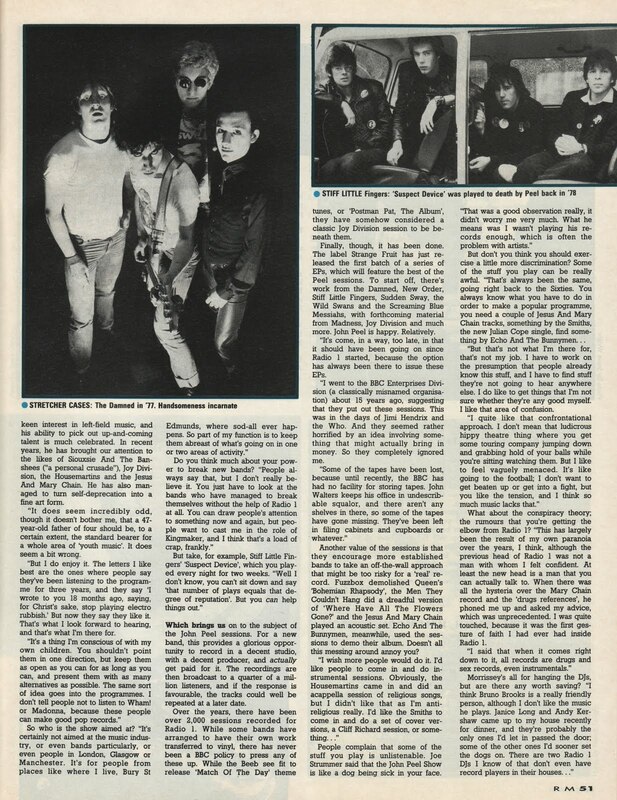 Issue dated 12 November 1988: in the review of the Wedding Present's album Ukrayinski Vystupy v Johna Peela, contributor Tim Nicholson comments that, "John Peel must be a proud man to have fathered such a crazy notion..". ↑ The new Top Gear Saturday slot began on 27 September 1969. Sunday evening's slot was,as mentioned, replaced by a series of Peter Sarstedt shows, produced by Frances Line (later responsible for Sounds On Sunday and Radio 2's folk shows, before becoming Controller of Radio 2 from 1990-1996) and featuring guests known to Peel listeners, such as Pentangle, Bridget St. John, Al Stewart and the Humblebums. ↑ see Talk page for further info. ↑ This was Tommy Vance's new show. Andy Peebles' new 8-9.50 pm Show also mentioned. ↑ Bowie's purchase of the Ritzy Cinema, Brixton (a famous left-wing "alternative" venue at the time) never happened and there is no record of the supergroup. ↑ Earlier, both Alan Freeman and Johnnie Walker had left Radio 1 after disagreements with Chinnery over the station's musical policy.